A & R started out pouring concrete floors, sidewalks and driveways and to this day they are still a large part of our business. 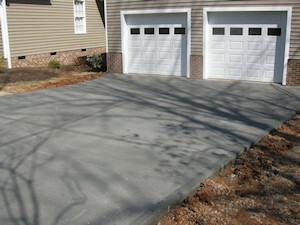 From the initial quote through the completion of the final exterior concrete, our customers can deal with one company. Proper mix design is essential for long lasting durable concrete. Using a contractor that cheapens the mix will have severe consequences down the road. The results of poor mix designs often appear in two to three years, when customers have no recourse. Jointing is the most important step in any flatwork project. Control joints are placed to anticipate the path of a shrinkage crack. The joint weakens the slab in that location and makes the crack follow the saw cut or tooled joint. If a slab is not properly jointed, random cracking occurs. Concrete is an incredibly versatile and complex building material. Over the last 50 years, the concrete industry has undergone dramatic changes. Computer batching systems have allowed precise amounts of additives to be utilized. These additives have increased strength, reduced shrinkage cracking, and altered set times. Hiring a contractor that understands the science behind these advancements and is not intimidated by them, results in a superior finished product.